It also might seem like a surprising question, given that global private equity assets under management run at about $2.5 trillion. It’s not like we’re talking about some hidden asset class. But the question came frequently and in different forms – sometimes about doing PE deals, other times about managing PE investments, still others about Fund Management and the GP-LP Relationship. So, over the years, Zeisberger – who is the Senior Affiliate Professor of Decision Sciences and Entrepreneurship & Family Enterprise at INSEAD, as well as Founder and Academic Director of the school’s private equity center – would write 2-3 page primers on the various topics and hand them out. Of course, being based in Singapore and continually on a plane – I caught up with her in Hong Kong – Zeisberger has a unique view not only into private equity’s history, but also current trends. So, what is private equity and what’s next for this mammoth asset class? That’s what we discussed. Chris Riback: Claudia, thanks for joining me. I really appreciate it. Claudia Zeisberger: Thank you very much for having me. It’s nice to connect from around the world. Chris Riback: Yes, from all the way around the world. Opposite times, opposite sides of the world, but here we are. The technology is excellent. And the Skype connection is very clear, so off we’ll go. I want to ask you about the books, as well as about private equity trends, particularly in Asia. Let’s start though with the books, as I’m sure you’re extremely proud, and maybe even just a little relieved to have them published, so congratulations on that. Tell me about them. Why did you write them and who are they for? Claudia Zeisberger: Yes, absolutely. I was quite happy to hand the scriptcounter parties. I often argue that there’s nothing helped by having an uneducated counter party. It doesn’t matter whether it is your investee companies, your potential investors. If they’re coming with the wrong expectations to the table, that certainly does not help the private equity firms. Chris Riback: It came about, actually, my understanding is, this isMaybe they’re for courses. But that you, to try to help people understand, okay here’s what this means. Here’s how you should think about this. And is it someplace along that route that you said, “Wait a minute. We could actually compile all this. What’s missing … I’ve got all of these sections or chapters or monographs, perhaps, but there’s really a full book here. People keep asking me for this help. I ought to put all of this together into one book.” Is that right? Is that kind of how this came together? Claudia Zeisberger: Yes, pretty much. Over the years, I’ve been writing whatfundraising, be it venture funding, be it impact investing, real estate investing. And the reason was very simple. I would come out of a class or a conference or a workshop with executives and people would say, “Well this was fantastic, but I am really interested in X, Y, or Zed.” A specific topic that, given the time constraint for most of my engagements, we just didn’t have the time to address. So I started writing two, three pages initially. Some of them then became actually quite lengthy dissertations with links to potential sources. And at one point, I looked at them and I said, “Look, all this should really be put into a book because it would make my life a lot easier. I could just say, ‘Please read the book, chapter 22, and you’re off to the races.’” That was really up … That was the starting point for the book. Chris Riback: So it wasn’t really for other people. It was to make your own life easier. Now I understand. Claudia Zeisberger: Oh, absolutely. In a true German fashion, yes. I wanted to be very efficient. Chris Riback: And you understand as well, that now that you’ve written a book, you’re obliged to subsequently do a blog. I mean, in this age, you cannot stop just with a book. You’ve really painted yourself in a corner. You understand? Claudia Zeisberger: Yes, I’ve been told so. I’m just wondering while I have at INSEAD quite a few colleagues, obviously, especially in the economics department that do write blogs regularly. I’m just wondering if there’s enough for a blog to feed the blog on a say, daily. Certainly not, I think. Weekly, maybe, but maybe monthly basis. This is on the list of things to do, yes. Chris Riback: Okay. We will all stand by for that. In terms of content of the book, and as well, I guess the editorial approach, was the blending of your own insights, which you just described in those primers that you’ve written throughout the years and that you updated obviously, and your colleagues. But also really significant and important contributions from global professionals. How did you pull that off? Claudia Zeisberger: First the idea came last year in summer where Iwas close to their heart. And I started to reach out. The first one was Graham Oldroyd, a former partner at Bridgepoint, who was also an INSEAD alumnus. And I flew the idea past him. He has been in my classes over the years and he said, “I think that’s a great idea and I would be happy to do the first one.” His was the first one, which was fantastic. I should also add that all the guest comments in the book are written by the guest authors in their own voice and were not edited, so you will see there are quite different styles. Some are quite cynical. Some are quite funny. Some are quite serious about it. It was good to see that not all of them took themselves too serious. Chris Riback: Yes, it was really useful and interesting to see that, and as well, to get the different perspectives. You reached out to folks globally from different perspectives, in terms of what they did, how they invest. It does really come out. Obviously, you had a professional, but an investing career before your academic career, but now that you’ve been, whatever, I guess 10, 12 years in academia, to have that matched up with real time professionals, it’s a terrific approach, and I think really helps the reader. As you read the contributions from the global professionals, what surprised you? What did you learn? Claudia Zeisberger: That’s an interesting question. My first take as the contributions came in over the last year was that private equity is complex. It takes a village. It takes a real professional, thoughtful and competent team to run a professional private equity franchise, especially over time. As I always say, everyone can raise a first-time fund, potentially a second-time fund. The proofs in the pudding by fund number three because by that time, obviously the results of fund number one are in, and the LPs can see what the cash on cash returns are. You don’t sell anymore just a promise. You sell real investments with real activities and real results. What I also noticed, that private equity is getting more complex. I don’t think it was ever an easy way to deploy capital, but it’s getting more complex in today’s environment. This is partly driven by the demand from the LPs, partly driven by the regulatory environment, and to some extent, by more competition. And more competition, not just from more GPs and different GPs, but also competition from some of the more, yeah, the more advanced or the more aggressive LPs. Chris Riback: That’s a great compilation of what’s going on.to. So just to finish off on the book, take me quickly through the sections, or take our listeners quickly through the sections. There are five of them, private equity overview, and then doing deals in PE, managing the private equity investments, fund management and the GP, LP relationship. And then the evolution of private equity. 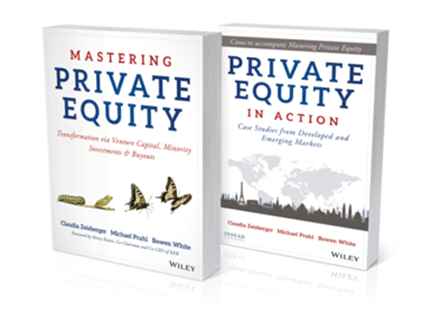 I can prompt you if you don’t remember exactly which the five parts … And we should mention we’re talking right now about the Mastering Private Equity book. You guys have as well the Private Equity in Action, which are the cases. Take me through each of the five sections quickly. How did you decide to organize it that way? Claudia Zeisberger: We started off with the private equity overview section to give those readers a leg up that are not from the industry, that are not professionals. We go over the individuals, the essentials of private equity, what actually is private equity. What is a private equity fund? What is that vehicle? What are LPs, GPs? It is really, really important to get the language right. Once you dive deeper into the chapters, we just reference back to the earlier chapters, obviously if there’s a need to, but we also expect the reader to have that language under his or her belt. We then basically have venture growth buy-out as kind of the standard private equity activities. Then we have, in chapter five, a few alternative strategies that we touch on, so distressed investing, real estate, infrastructure, and so on. Then section two goes into doing deals in private equity. We basically go down the value chain. I mean, private equity, I tend to say in class, it’s a simple business. You buy a minority or majority stake. You improve and then you sell. We basically step exactly down that process. What is the deal source saying? Target evaluation. How do you price dynamics when you price a deal? How do you structure it? Then we have a quite a heavy chapter on transaction documentation, as you will appreciate. That’s not an easy one to squeeze into one chapter. The next part then is managing the PE investments. To what extent, what do you actually do once you’ve executed the deal? There’s the corporate governance angle. There’s obviously the work with management teams. How do you incentive management teams to stay on the ball and to achieve those targets that you’ve set? We talk about operational value creation in this day and age, obviously an incredibly important chapter. Then we touch on responsible investments, the impact investment slash ESG genesis. Obviously then, the last one is exits. How to do exits. How to prep for exits and how to get them right. Then we go over to the fund management sides and look at the GP, LP relationship a little bit closer. Obviously, it starts off with fund formation, how to set up a fund. Fundraising, LP portfolio management, performance reporting, and then winding down a fund, especially in this day and age, talking about tail end funds and a little bit on zombie funds, as well. We felt that was important. LP portfolio management was an important one because I do engage quite a lot with LPs of all shapes and colors, from large institutionals, pension plans, insurers, to sovereign wealth funds, all the way to family offices. Obviously the whole idea around managing or getting the target exposure to private equity was very, very important, and LPs do struggle with it, especially newcomers to the industry. And then maintaining that exposure without a ballooning portfolio was very important. We then felt in the evolution of PE, we wanted to touch on a couple of things that have of course, become very important over the last five to 10 years, and that’s direct investment, co-investments and direct investments by LPs, listed private equity firms. There is a chapter on risk management and private equity, which is a little bit of a nudge, if you like, towards the industry. I wish, at times, the industry would be a bit clearer about its communication on how it thinks about risk. I’m hoping that this chapter will potentially lead to further articles and communications, conversations with PE funds, as well as with LPs. Then we look, obviously, at secondaries. Given the dry powder in the secondary markets right now, this was not to be avoided. Then we felt in the last chapter, and we wanted to be heard as authors, because the rest of the book is written very much at arms length. We try not to bring our biases in, and hopefully I’ve been able to achieve that, but the last chapter is really basically a comment by where each, my two co-authors and myself, each take a part and basically write about what’s close to our heart. That basically follows exactly the, yeah, the deal making in private equity. We structured it in such a way that it’s easy for people to jump in and find what they’re looking for. Chris Riback: That’s very clear. It kind of ends, as what you really took away as the professionals were contributing, and that was the complexity that you just mentioned. The concept that private equity is getting more complex. Tell me more about that. Who does that help? Who is that hurting? What are you seeing in terms of secondary effects maybe, in terms of private equity? If it’s getting more complex than necessarily, I would assume, there are going to be reactions and counter reactions to that. What are you seeing in terms of secondary effects, as well? Claudia Zeisberger: Where do I start? Let’s start with actually what privatetraditional private equity strategies. There’s venture, there’s growth equity, and then there’s buy-out. But I think nowadays, we need to really talk about private capital. There’s much more to that industry. It has, partly because of its attractiveness and the capital flow into the industry, certain fund franchises have started to expand, adding real estate, adding infrastructure, adding distressed investment funds. I mean, just look at what’s going on on the private debt side these days. This is probably one of the least commented on and most interesting areas right now, just looking at the new players coming into that. That’s one part. Let’s call it private capital, which basically includes then everything that is being deployed in a private equity type fund structure. The next part that is really complex, and it’s changing, is the trends in general. I think private equity these days, for example, needs to have an opinion, at least. It needs to be educated about technology, and the digitization of businesses out there. This ties, to some extent, back on operational value creation, but that has led, because you’re asking for secondary effects. This has led to the interest from private equity funds in technology and digitization, has led to a conversion of private equity and venture capital. I’ve had the opportunity to sit in several conversations where you had a venture capital fund on one side, and you had a true blue private equity operator on the other side. And both of them were basically having the conversation about, “Look, we need to have some thoughtful and educated answers to our portfolio companies when it comes to digitization. You guys obviously are in that space, to examine for your venture funds. Your investee companies, to some extent, drive that trend. Does it make sense for us to come closer together?” I think this is unique nowadays in this environment. Then obviously, we could have a long conversation. I don’t think we want to do that right now, in the interest of our listeners, about the rules and regulation in various continents from AIFMD in Europe, to the various SCC rules in North America and to various states of the environments here. But two trends basically I wanted to potentially touch on, as well, in addition, is number one, the standardization of large asset managers. Some of the larger private equity houses have really turned into asset management firms. When you look, in particular, at some of the firms, and quite a few a cross of them, whilst they may have all started off let’s say in the buy-out space, they are actually evolving in quite different directions. Some of them more focused on the distressed and turnaround side. Others more focused on the real estate side, whilst others are trying to be reasonably balanced with everything in the portfolio, from hedge funds to debt to credit to private equity. But overall in quite a few of them, private equity is now a smaller part of the whole pie. And that’s, to some extent, raises the eyebrows with at least some of the LPs, from what I’m hearing. Then the last trend I wanted to mention is basically thenudged to specialize. Chris Riback: When you were talking first about, when you were discussing the standardization and really turning into large asset managers, that sounded though slightly different than the specialization that you were just saying is required because on the one hand, historic private equity firms broadening into a wider range of asset management capabilities versus, at least as I was trying to interpret this, versus the need to really be able to create, in your words, niche alpha. How do you square those two? Claudia Zeisberger: Exactly. I mean, that leads to then a final point. GP relationships on the block. The question is what does that … My argument is very often then, how will you be able to maintain that? Because some of the large players must deploy very large new funds on an annual basis. How you then basically maintain relationship with only 50 or 80 GPs, remains to scene, but that right now is clearly being discussed with some of the LPs already being executed. If you’re not part of the universe that some of the larger LPs can allocate to, you need to basically stand out for different reasons. That’s where the specialization comes in. Chris Riback: You wrote as well, recently in the LSE Business Review, the London School of Economics Business Review. You wrote about a tsunami of capital. Why do you see in-flows continuing? Claudia Zeisberger: Yes. That basically is, I’ve been questioned on that word. I had a quite a few emails after that was published. Well, I mean, look at the world around you. We’re in a low interest environment and interests, there has been one or two points in history where they jumped quickly, but let’s assume this is not one of those points. It will remain low for the time coming. We have seen that there are quite a few of the LPs that have stayed away from private equity or private capital in general in the past, have realized that they really cannot afford to ignore a new asset class. That has, arguably, achieved interesting returns, to some extent, better than the public markets. We’ve seen the Norwegian pension plans, Japan’s GPIF basically jump into the fray, as well. Those are all very, very large investors. Pension plans, in general, all around the world, particularly Europe and North America, do have their issues because of their underfunding. They will therefore, by definition, be interested in an asset class that can achieve their target returns. Then we have new sovereign wealth funds that are coming in. Just the existing sovereign wealth funds alone have added around a trillion in investible assets in the last three years. That is a large amount of capital. And we have new sovereign wealth funds coming to the table from the emerging market. Look at Africa setting up new sovereign wealth fund. That will all be quite well funded. I think the overall, the tsunami of capital that we’re seeing is, to some extent, potentially even driven by the trend of some of the LPs to go direct because the funds that are allocated to the direct investment strategy are normally new funds out of the total AUM of LPs that are being carved out to go into that direction. I don’t think there will be a shortage of funding flowing in the coming years. Chris Riback: And I imagine that that would fuel, as well, some of what you were just talking about, about the bifurcation. As the in-flows continue, there will be increased need for firms to focus on what they do well and we can really prove that, and then other firms maybe branching out into broader areas if the funding is there. To close out, or to start to close out this conversation, particularly sitting here in the US, I can’t help but note your reference in that piece, in the LSE piece, to the Allen Greenspan phrasing of irrational exuberance. You wrote that, and I was struck by it, that you wrote that the consequences of such irrational exuberance are starting to show. Talk to me about that. That’s a phrase, particularly here in the US, that carries some meaning and some significance. It’s interesting to me. Does it carry significance as well globally? Do folks get that? You obviously do. Do folks get that reference, if you were to use that around the world? Claudia Zeisberger: People do. People pay attention to that, and then say why. Why irrational? I come from the point that investors need to be aware of the midterm to long term implications when so much capital is flowing into the industry. Here’s to some extent why. With so much money coming in, and to argue basically, the LPs have seen PE perform very well. That is the reason why fundraising has been so easy for the GPs. You return money to your LPs. Of course, the LPs are happy to re-up basically for your future fundraising. That has consequences and we’re seeing that already now. And maybe we see it here in Asia, where I am based, more so, and maybe that kind of shapes my thinking. Globally, we see deal making being reasonably slow, at least in 2016. 2017, right now, we see a slight pick-up. We’ll see how this will continue. But obviously there’s no surprise because with more money in the market, as soon as a deal comes on the table, you have several operators showing up to the deal. More people, more parties showing up to the deal obviously drives up prices. Deals are done nowadays at real ambitious evaluations. We have, I know in the US, end of last year, someone said at a conference, one of our GPs said, “Well 10 is the new eight now,” in referring to EBITDA multiples. To be honest, here in Asia, we would be very happy to see 10 as the new eight. Here rather, is 20 is the new eight. When you look across Asian deals, especially with say China and India, you’ve seen 15 to 20 times EBITDA is pretty much where the deals are being done right now. In China, if you add tech deals to that equation, to that universe, the multiple is rather 29 times EBITDA. There have been individual deals done significantly higher than that. The question basically remains. Will those ambitiousto a successful exit? Meaning a profitable exit in the years to come. And look, private equity has often been pointed to as overstretching, overreaching, and there are good arguments being made why those valuations are right. Why there is enough potential for those companies to do well in the years to come and surprise everyone, but for the experienced participants of the private equity market, those are ambitious prices to be paid. On the other hand, you must basically deploy in private equities. All those large funds being raised right now, one starts basically wondering at one point, they will need to come to the market, and will need to basically pay those ambitious deals. Now on the other hand, fewer deals being done right now, let’s say in market and the money stays on the sidelines, obviously will lead to fewer exits in the future. That’s a simple argument. Slower deal activity will lead to rising dry powder. That may make the LPs less happy with private equity, thereby potentially looking for greener pastures somewhere else. Multiples at record levels will obviously also encourage quick exits. If I see high valuations out there, one may exit a deal much faster than one had planned to, which then obviously questions the argument of operational value creation, which is obviously impossible to do is deals are only being held for a short period of time. Those are my concerns. Chris Riback: Yes, those are. I guess if you’re looking at the potential of a 29 times EBITDA multiple, pretty hard to consider holding onto something if you’re looking at that potential. I understand that was on the high end of some of the deals in China. Yeah. Those are some impressive multiples. Claudia, thank you. Thank you for your time and congratulations on the two books, the Mastering Private Equity and Private Equity in Action. An incredible overview of private equity and venture capital. And then case studies, as well, to help folks really get through it and see it all in action. Thank you for the books and thank you for your time. I really appreciate it. Claudia Zeisberger: Thank you, Chris. It was a pleasure.